Just a block and a half from the Snowflake Lift are the the Retreat condos for sale. When it was built there were fewer condos in this area, and the Snowflake did not exist. Although the growth in this area has made the name a little bit less descriptive, The Retreat condos have increased in value as convenient ski condominiums. The walk to the lift is easy, and a free town shuttle stops just outside it, so that you can get to the other base areas or to downtown. From the mountain, gentle Four O’clock run brings you just across the street from these condos. Find out more about living in this residence, or start your search with the available Retreat condominium listings found below. A multi-story building, The exterior of The Retreat condos was recently remodeled with a natural cedar siding and stone accented entryways. The buildings are an efficient modernist salt-box style and each unit has an open galley kitchen, and sliding glass doors to balconies in the living room and the master bedroom. 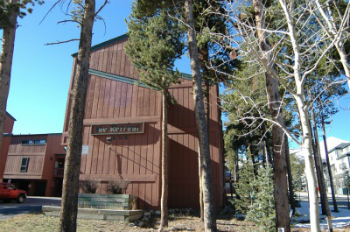 The Retreat are smaller condos that have great short-term rental potential because they’re affordable and desirable location at the Breckenridge Ski Resort. Getting to the ski mountain is easy in winter, and during the summer can be your ticket to finding trails, walks and other experience in the national forest. The Retreat is also part of the Upper Village Homeowners Association that maintains an indoor/outdoor swimming pool, hot tubs and a small clubhouse with changing area. Amenities: close to ski lifts, close to downtown, across the street from Four O'clock run. From the Riverwalk Center in the heart of downtown Breckenridge, cross Park Avenue and head west on Four O’clock Road and climb gradually uphill for a block to Primrose, turn left and the Retreat will be the next condos on the left at 205 Primrose. If you are in search of that idyllic ski-in/ski-out lifestyle, then The Retreat condos may be perfect for you! Contact us today for more information, or to see one of the condos for sale.